Congratulations ladies! To claim your prize, please contact me with your full name and address by January 16, 2013. Shipment is to US addresses only please. Many thanks to Susannah Fullerton and Voyageur Press for the giveaway copies. 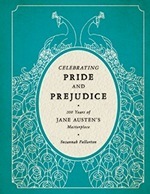 Check back in February for my review of this new book during The Pride and Prejudice Bicentenary Challenge 2013. Happy reading to the winners! Hisssss, booooo. I wanted to win this!